Condensation Land is back (more about that later). You can read a quite detailed history of Condensation Land here. If you want to comment, please do it here. I’ve upgraded Condensation Land to Diva r13861 — this is the diva distribution release corresponding to Opensim 0.7.0.2, and it incorporates a two cute new logos (one saying “Diva Wifi”, and another one that says “Powered by Opensimulator”) and a number of enhancements to the Wifi pages. You can read a description of the most important changes in Diva’s article, or, if you have an account at Condensation Land, try it by yourself here. Opensim 0.7.0.2 is “a minor bug-fix release”, so that things should work more smoothly that with r13558. As always, if you encounter any problem please email me. I’ve posted an article about Temple, Conceptior and AngelicoMiguelis, the new islands by Omurtag Milev, in my personal blog. I’ve updated the ‘About’ page to be a little more informative. Please email me if you have some comment, correction, etc. 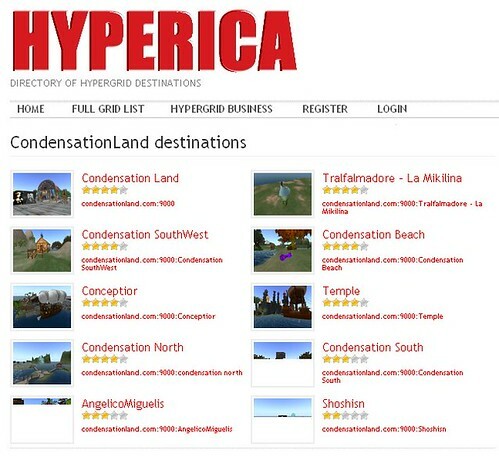 Maria Korolov, the editor of Hypergrid Business, has started a very nice directory of hypergrid enabled destinations called Hyperica. 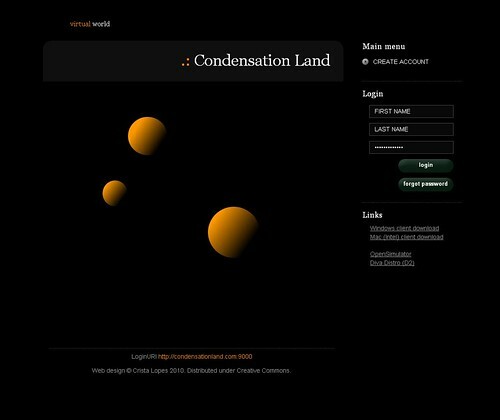 All the public regions in Condensation Land are listed in Hyperica: http://www.hyperica.com/tag/condensationland/. Of course this is due to the fact that few regions have publicly enabled hypergrid yet — we’re a home-based, non-for-profit mini-world, created during our free time. Still, it’s nice to be there. I’ve upgraded Condensation Land to use release 13558 of the Diva distribution (D2). R13558 is based on Opensim 0.7.0.1 post fixes, and it incorporates all the changes and enhancements of Opensim 0.7, too numerous to list here. D2 adds a great web new interface called “Wifi” to Opensim — you might need to redefine Condensation Land in your grid manager to make use of it. Simply open your grid manager, delete any reference to Condensation if there is any, click the “Add new grid” button, enter anything in the “Grid name” field (it will be filled automatically), and type “http://condensationland.com:9000&#8221; (without the quotes) in the “Login URI” field, then press “Get Grid info” and “Apply”. The new web interface can be accessed at http://condensationland.com:9000/wifi — you will be able to change your password and your email, and you can do some simple forms of inventory management from the web. Enjoy! :-) And, as always, if you find something erroneous/strange/missing, please email me and I’ll try to fix it asap.